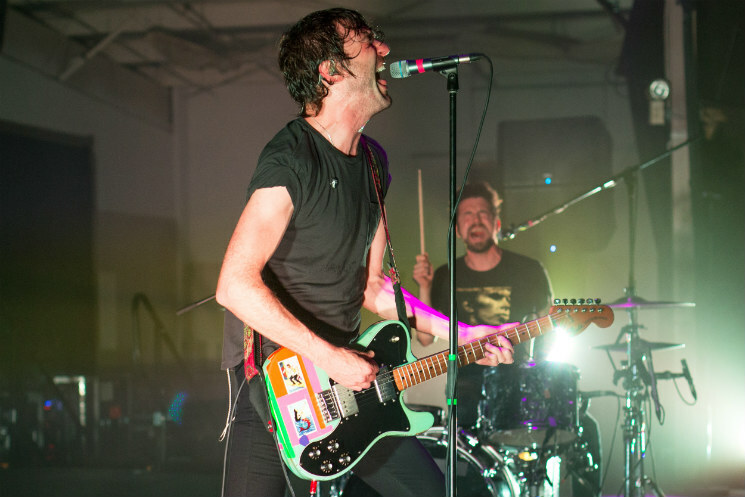 Japandroids took to the Forum Multipurpose Room's stage Thursday night (October 19) to Mogwai's "Punk Rock," the opening track from the Scottish post-rock band's 1999 album Come On Die Young. The track, spoken word set to instrumental music, samples a 1977 interview with Iggy Pop conducted by Peter Gzowski for the CBC in which Pop condemns the term "punk rock" and describes the sensation of his performances: "When I'm in the grips of it I don't feel pleasure and I don't feel pain, either physically or emotionally…Have you ever felt like that? When you just couldn't feel anything and you didn't want to either?" On the surface, it seems an odd thematic choice for Japandroids, who from the earliest throes of their career — All Lies, or Lullaby Death Jams, or their breakthrough Post-Nothing — have made music bursting at the seams with feeling, sometimes almost comically so. But thinking back about the band's 14-song headlining set, I found myself coming back to those words and considering how rock music — in particular, the big, accelerated forms that Japandroids make — generates, amplifies and shares feeling with its audience. Pimienta famously asks men to move to the back to give women space at the front of her shows — something that felt worlds removed from the mass of mostly male bodies slamming into one other during Japandroids' set-closing "The House That Heaven Built," creating an inclusive experience among a few but pushing so many others to the back of the room. Later on, as my energies were draining, I watched Partner close out HPX's second night at the Seahorse, playing to rock's gestures and routines tongue firmly in-cheek but with boundless enthusiasm. The band connected with its audience with humour, a sort of affectionate post-ironic sincerity that felt like it allowed people who might typically eschew or feel embarrassed by rock's sometimes absurd "meaningfulness" to find their own space within it. There's absurdity to be found in Japandroids' work, and ample sincerity as well — but at a few points last night I found myself at more of a distance from the band, one I've loved for years, than ever before. Maybe part of it is that Near to the Wild Heart of Life feels like an album where the specificity of Brian King's lyrics, somewhat ironically, make them more difficult to connect with than the band's more mythic takes on love, lust and nightlife living. Or maybe it's just that we're in an age where the anthems we need probably aren't going to come from two white men playing "punk rock" — maybe these aren't the feelings I'm looking for anymore. But the feelings found me still the same, despite all this. Because "The House That Heaven Built" is one of this decade's greatest songs, all joy and piss and adrenaline that soars no matter how much of King's voice is left at night's end. Because Japandroids are a band that can perform "Young Hearts Spark Fires" like their hearts are still a decade younger, their fires still sparking new blazes. Because the band can hold back the release valve of a song like "No Known Drink or Drug" until it explodes into something magnificent. Because even after doing this for years, Japandroids tear into their material like they're running out of time, and may never get to do it again. What Pop and Gzowski talked about 40 years ago was really transcendence: the idea that music can push us into a sense of something beyond the ordinary. I'm grateful to live in an age when there are so many bands and artists and ways to do so — and that Japandroids, at their very best, are one of them.